In Situ is an exhibition that is taking over the Mosman shopping precinct with sculptures and installations. 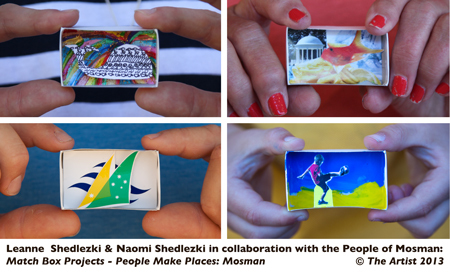 As part of this exhibition we are presenting an insight to People Make Places: Mosman, a project we have been developing in collaboration with the people of Mosman. Our work is being presented at Shop 10, Library Walk, Military Rd Mosman - in front of the courtyard cafe of Cafe Mosman - opposite the library. It is on view 24/7 to the 20th October. In Situ 2013 is a collaborative exhibition between Mosman Art Gallery, Mosman businesses and participating artists. It comes under the umbrella of the Festival of Mosman. We thank Mosman City Council for providing us with our Match Box Depot Pop Up in the lead up to this project. This entry was posted on Sunday, October 6th, 2013 at 10:08 am	and is filed under Our Blog. You can follow any responses to this entry through the RSS 2.0 feed. You can leave a response, or trackback from your own site.